Katherine Chivers and Chris Neubauer, students in the documentary film certificate program, made the film "Berning Love," which was screened at the Berlin Independent Film Festival. Updated: Feb. 27, 2017 at 2:33 p.m.
Last year, seven graduate students in the documentary film certificate program set out to explore how this presidential election cycle consumed all aspects of people’s lives – including in the bedroom. Their film “Berning Love” chronicles the rise of the website BernieSingles.com, a dating website for people who support the Vermont senator’s political views. The students said they made the film to explore the intersection of romance and politics. The film premiered at the Berlin Independent Film Festival, one of the most well-known festivals for indie films, this month. 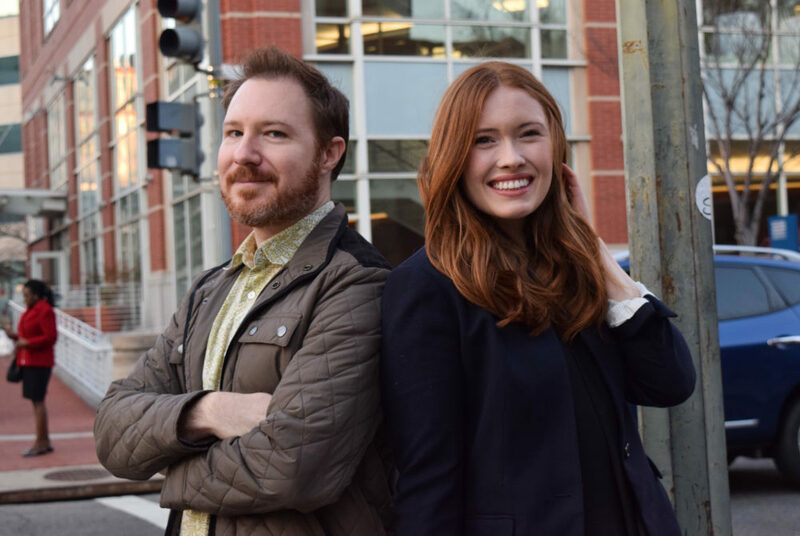 The graduate students who made the film created it as their final project in GW’s documentary program last spring – a six-month course led by Nina Gilden Seavey, a research professor of media and public affairs and history. The film follows Sen. Bernie Sanders, I-Vt., supporters in the District as they look for love leading up to the 2016 D.C. primary last June. “Berning Love” explores how the activists entwined their political views with their romantic relationships by using politically affiliated dating websites. Sujatha Bagal, the film’s co-cinematographer, was one of the three graduate-student team members who traveled to Berlin this month to show the film at the Berlin Independent Film Festival. Bagal said that the audience and critics at the festival responded well to the film. The group is also scheduled to screen the film at the Green Mountain Film Festival in Vermont this March, and the BAWIFM Shorts Showcase in San Francisco later this year. Bagal said the film exposes how entwined politics can be in people’s relationships. Katherine Chivers, a co-producer, said the group had free reign on selecting a topic but it was difficult to come to a consensus. The group originally planned to focus on Sanders’ supporters and make a film about an activism group. Chivers said the process began when she reached out to the founder of BernieSingles.com to inquire about sending an email blast to their subscribers to source for the film. Through that, the team began meeting with people to feature in the documentary. “We met so many fun, kind, interesting people throughout the process,” Chivers said. Chivers said while the process of meeting with members of BernieSingles.com was interesting, making a documentary worthy of being premiered at film festivals in just two months is difficult because it includes research and filming. Chivers added that Jennifer Myhre, the film’s research director, found that the roles of love and politics have become more connected over the past few years because of politics’ increasing polarization. Chivers said that in the past, people usually wouldn’t discuss their political affiliations in dating, but now it’s a must for some. Myhre researched how people use dating websites and based parts of the film on sociological studies, Chivers said. Christopher Neubauer, the film’s co-producer, said the negative political rhetoric during the 2016 presidential campaign played a role in polarizing the nation and wanted to show a positive side of politics. “One of the most compelling reasons that we were drawn to this topic is that we were really tired of the negativity in the cycle that was going on, and we wanted to portray something that was more positive and hopeful,” Neubauer said.